Unemployment Survival Guide: Higher End Living... it up! The Knock-Off. Higher End Living... it up! The Knock-Off. Don't put off your sense of style and fashion just because you're liberated. Find those items that you gravitate towards or would buy w/ a little more substantial income and make it happen - at half the cost! This applies to interior design projects as well as fashion. You can knock off the look and feel of a room for half? 1/3? the cost. Again, what you don't have in cash, you make up for by spending your time. When u have money you can easily purchase exactly what you want. But w/out the cash upfront, you're investment now comes in time - which you have - MAKE, don't buy, search, don't settle. Upgrades on nearly anything can happen w/ some elbow grease, the internet, your willingness to spend your time and your own innate creativity. So, get your tear sheets together, interiors, clothes, shoes, art. Then set about how you're gonna knock off what you really want - because you totally can. 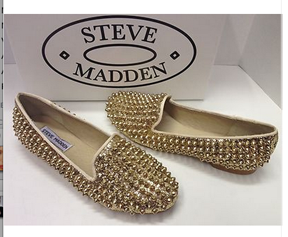 It's entirely possible to have those $175.00 Steve Maddens! You don't have the $ right now but you have the time.... So you get to get your creative juices going, have a project to do during your day and score those Maddens for a steal! This is kinda like the High/Low Project - but w/ fashion. I bought look-a-like sparkly shoes at Payless for $17. Mine sparkle a bit red gold as opposed to yellow gold like the ones on the left. But a bottle of sparkles in my closet can remedy that if need be. Looking for the studs to go w/ my yet-to-be-used BeDazzler. Haven't found them yet, but its looking like the cost of the other metals is running around $5 per 100 count. Each show will require about 200 studs each. So, theoretically, you can get these $125 slippers for about $40. Granted I have some of these items already - like the BeDazzler but think about investing in tools that might pay you back in the long-term. The How-To of FREE FREE FREE!